We all know that a healthy diet can provide many benefits that can improve our quality of life. Clean eating not only makes us feel better in our own bodies but it also has a way of making us shine brighter on the outside. As we age and our hormones tend to get a bit out of control, it becomes even more important to find natural ways for achieving a healthy lifestyle which will also help us to maintain younger looking skin. The old saying that you are what you eat carries a lot of weight especially when you want to look healthy and youthful. While exercise and vitamin supplements are helpful in keeping a youthful appearance, there are 6 foods that you may want to consider adding to your diet which will naturally balance your hormones and help you achieve younger looking skin. Keep in mind that these 6 foods are a great addition to your diet to naturally balance your hormones. But do not sacrifice other necessary foods such as proteins, healthy fats, and other essential vitamins and minerals. The hormone testosterone which is naturally produced by our bodies is the main culprit behind acne breakouts which can wreak havoc on your skin. To maintain a proper balance of testosterone and prevent skin breakouts which will keep skin looking younger, we need to keep our testosterone levels properly balanced. To promote a healthy balance of all of your hormones, you need to eat a healthy balanced diet. 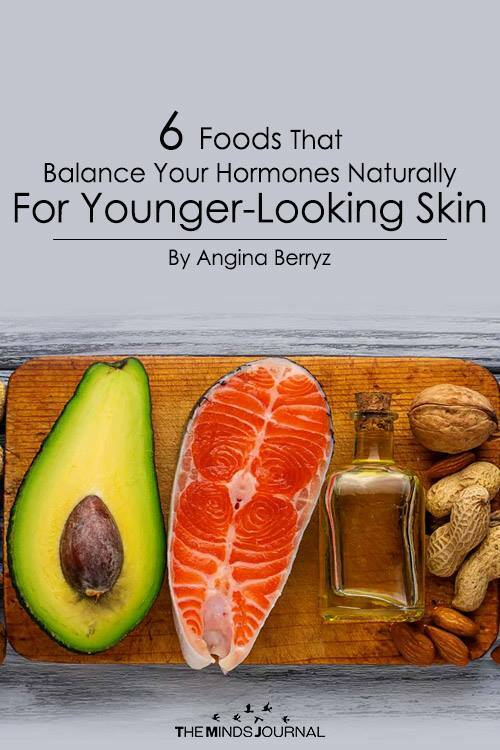 The following 6 foods will actively assist in balancing your hormones and will also prevent wrinkles and acne breakouts while keeping your skin youthful, supple, and healthy. Almonds have been scientifically linked to boosting and balancing the adiponectin hormone which aids in regulating our blood sugar levels. This hormone has also been shown to prevent the high insulin-high androgen ripple effect. The consumption of just 11 almonds per day has been proven to decrease levels of testosterone which contributes to dry and thinner skin. You can increase your amount of almond intake to further the hormone balancing benefits from this super nut. However, keep in mind that almonds are high in calories so you don’t want to overdo it. Avocados are a superfood that carries so many health benefits including hormone balancing which will lead to the younger looking skin. The good fats present in avocados (which are also present in olive oil and coconut oil) help the body to maintain healthy cholesterol levels, which is key in proper hormone synthesis, by enabling the skin to release and circulate the hormones it needs to remain healthy and youthful. The healthy fats in avocados also help boost the natural lipid bilayers in skin cells keeping your skin looking plump, hydrated and glistening. By adding a half of an avocado to your daily diet, you will begin to see the benefits of its monounsaturated fatty acids, fiber, potassium, vitamin C, vitamin E, and lutein which also prevent sun damage from occurring to your skin. Broccoli is filled with antioxidants, vitamins, and other healthy compounds that are essential in boosting the liver’s ability to metabolize estrogen. Estrogen increases collagen production which keeps your skin firm and healthy while also increasing blood supply to the skin so that it maintains high self-reparative function. When estrogen levels begin to decrease in the body, you will notice that your skin can start to appear dry and wrinkles begin to show. Other dark leafy greens such as Brussel sprouts and spinach will provide the same benefits for the younger looking skin. It is recommended that you add one half to one cup of dark leafy green vegetables to your daily diet for maximum benefits. The HDL cholesterol present in egg yolks is required for your body to properly produce essential hormones. 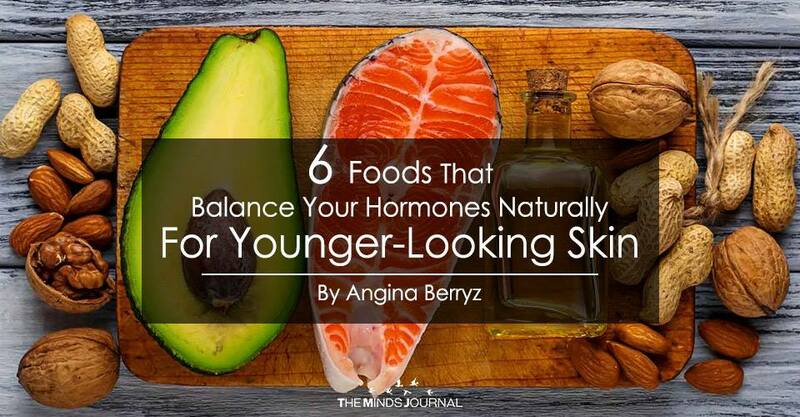 And when your hormones are balanced at the proper levels, your skin will be softer, more supple, healthier, and appear more youthful. One egg per day should suffice for providing your body with the right amount of good HDL cholesterol. So if you have been limiting your egg consumption to the whites only, it’s time to add that yolk back to your breakfast if you want to maintain younger looking skin. Quinoa is a grain that is packed with essential nutrients such as protein, magnesium, and phosphorus and will not only boost your energy levels but will also stabilize your blood sugar levels. Many other grains are high in glycemic acid which increases the body’s blood sugar levels, but quinoa is a complex carbohydrate that is high in protein so it will keep blood sugar levels stable by preventing the high insulin-high androgen ripple effect that elevates blood sugar. Swap out other grains for quinoa to reap the benefits of this healthy grain and find your way to the younger looking skin. One-half cup of quinoa twice a week is enough to provide your body with all the energy boosting nutrients and hormone balancing minerals that it needs to keep your skin young and healthy. The benefits of salmon for increased brain function and improved heart health are widely known. But salmon, with its high content of omega-3 fatty acids, also provides hormone balancing benefits. Omega-3 fatty acids synthesize cholesterol and help regulate hormones. Salmon also carries powerful anti-inflammatory properties that will help prevent acne breakouts and eczema. And the fewer skin eruptions that occur, the healthier and more youthful looking your skin will appear. Just add a 4 ounce serving of salmon to your meal planning twice a week to experience the wonderful skin benefits of this overachieving fish. Next time you are grocery shopping, be sure to add these 6 amazing foods to your cart. And you will be well on your way to healthier, younger-looking skin.